On Monday, March 1, Bridger Fetters will fly to Macau to begin his first term as a Global Ministries staffmember there. A commissioning service will be held Sunday morning, February 28, at his home church: College Park UB in Huntington, Ind. Actually, a commissioning will be held in both of the two Sunday morning services. Just a reminder to senior pastors and licensed ministers: your annual reports are due to Bishop Phil Whipple on Monday, March 1. Lots of reports have been coming to the office this week. Denny Miller giving instruction to the group. 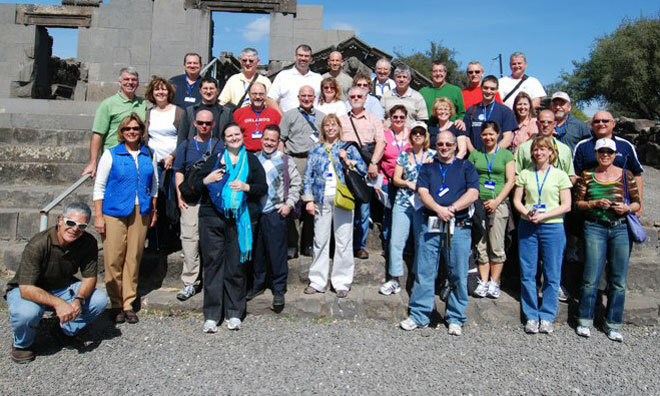 A group of UB ministers is concluding a “Familiarity Tour” to Israel led by Dennis Miller, pastor of Emmanuel Community Church (Fort Wayne, Ind.). 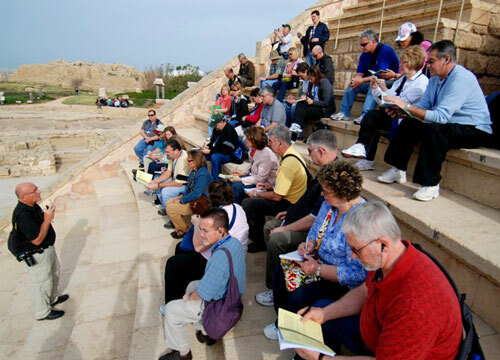 This trip is primarily for United Brethren pastors and spouses who haven’t visited Israel before, and who would be interested in leading a trip sometime in the future. They’ll be returning this weekend. You can view a whole bunch of photos, divided up by each day, on Denny Miller’s blog. Ruth Snider, a retired minister with the United Brethren Church in Canada, celebrated her 90th birthday on February 24, 2010. Ruth served several churches in Ontario over the years, beginning with the Roseville church (Ayr, Ontario) in 1943. She graduated from Toronto Bible College in 1944, and was ordained in 1967. In 1984, after 10 years as pastor of Bloem Avenue UB church in Toronto, Ruth became a director with Food for the Hungry Canada, which later became Hope International Development Agency. After she retired from Hope, she pastored two more churches–Shiloh UB (Tiverton, Ontario) and Roseville (once again). 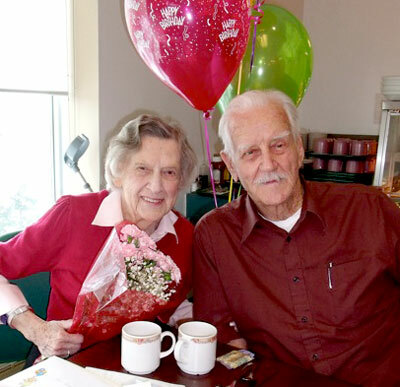 Ruth and her husband, Charlie (who turned 90 last August) were married in 1942. They have both been highly involved in mission work over the years. Charlie has worked in many different countries throughout the world as a “technical missionary,” heading up or participating in various types of building projects. They now live at Lakeshore Lodge, a longterm care home. Most of the General Conference delegates climbed this hill which overlooks the camp. The structure in the foreground will eventually have two levels--a cafeteria on the lower level, and a conference meeting area above. 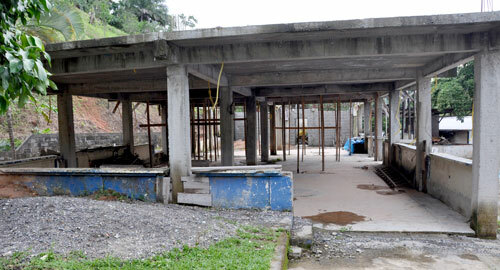 A side view of the future camp cafeteria. An upper level will be added with meeting space. 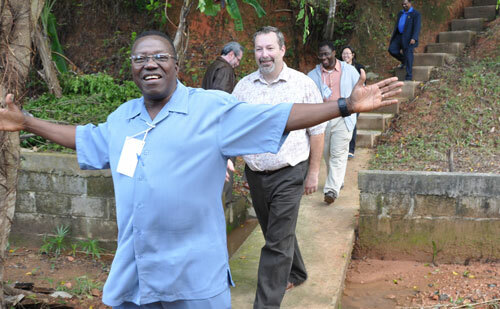 Billy Simbo, bishop of Sierra Leone Conference, leads the way down from the hill overlooking the camp. Jeff Dice is directly behind him. 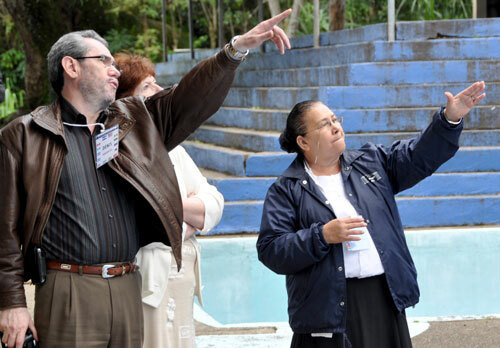 Juanita Chavez, superintendent of Honduras Conference (right) points out some features to Denis Casco (Mexico) and Donna Hollopeter. 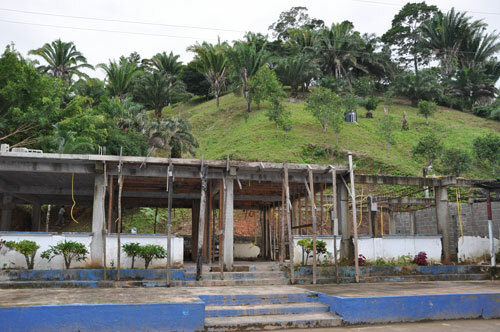 On Monday afternoon, January 11, the General Conference delegates took a field trip to the Honduras Conference camp located to the west of La Ceiba. The conference acquired this property several years ago. The place is very rough. Most of the buildings need a lot of work. But the potential is great. One priority is the cafeteria building, which is currently just an open shell. It will be enclosed and a second floor added containing meeting rooms. The caretaker’s home, where a family now lives, also needs to be enlarged and improved. The camp is already being used in various ways, and is being rented out to other groups for retreats and other events. You can view a large batch of photos–84 of them–from the trip to the camp. The thumbnails below give a few selected shots of the camp and its many buildings. 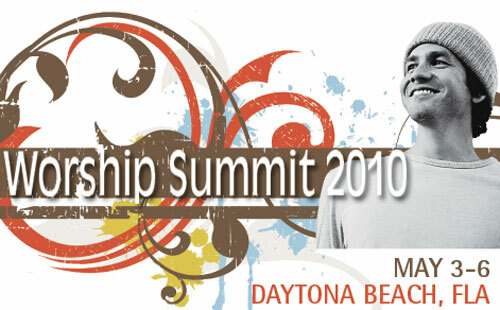 The first-ever UB Children’s Ministry Leaders Summit will be held May 18-19 in Holly Hill, Fla. The event will be hosted by First UB church in Holly Hill. This is aimed especially at staffpersons who minister in this field. You will have the opportunity to spend time with children’s ministry workers from across our denomination: learning from each other, sharing ideas, networking, relaxing, and soaking up the Florida sunshine! This is a unique opportunity for you to fellowship with others who share your passion. We know you will find it helpful, encouraging, and fun. Best of all, it’s FREE! (Go ahead, read that sentence again.) Yes, we really did say FREE! All you need to do is get there and we will cover your meals and lodging for 3 nights (May 17, 18, and 19). So drive, fly, or start walking now, but do not miss this amazing event! Where: First UB in Holly Hill, Fla. Cost: Travel expenses are up to you. Lodging and meals are provided. Why: Networking, fellowship, encouragement, and fun! To register, and for more information, go to: UBKids.org. A conference focusing on spiritual care will be held May 18-20 at the Oglebay Resort and Conference Center in Wheeling, W. Va. This event is aimed at church staffpersons who work in such areas as spiritual care, assimilation, and visitation. Cost: $75. That includes lodging on May 18 and 19, and 1 dinner. You will need to purchase 2 breakfasts, 1 lunch, and 1 dinner. A conference for United Brethren worship leaders, especially staffpersons who work in this field, will be held May 3-6 in Daytona Beach, Fla. Two keynote speakers have been lined up. Workshops and morning devotions will be led by UB worship leaders. Cost. $110 per person. This will cover lodging and the evening meal. Pastors will be on their own for breakfast and lunch. Lodging. Accommodations will be on the beach. Larger group meetings will be held at First UB church in Holly Hill, about 10 minutes away. Transportation. You must provide your own transportation to Daytona Beach and and for getting around once there. We made some changes in the cluster system, which is our primary structure for pastoral training and accountability. One change involves staffpersons. Previously, we required all licensed ministers–senior pastors and staffpersons–to attend monthly cluster meetings. In some cases, staffpersons attended the same cluster as the senior pastor. In other cases, staffpersons attended a cluster with other persons in their area of specialty–a youth cluster, a pastoral care cluster, a cluster for music ministers, etc. Now, we only require that senior pastors attend cluster meetings. But we don’t want to neglect training for staffpersons. As a substitute for staffpersons, we are holding four “summits” in the coming months. These are two-day events designed for ministers in specific areas of specialization. April 26-30: UB Youth Workers Summit. This annual meeting goes back a number of years. It is not limited to staffpersons. Rather, UB churches are invited to send their “lead” youth worker, whether on the payroll or not. May 6-8: Worship Summit. This new event is designed for staffpersons who focus on areas related to worship and music. May 17-19: Children’s Ministry Leaders Summit. This new event is for persons who specialize in working with children. Again, it is not limited to staffpersons. As with the Youth Workers Summit, it’s limited to your “lead” children’s worker. May 18-20: Warmth Summit. This new event is for staffpersons whose ministry involves such issues as spiritual care, visitation, and assimilation. As bishop, I encourage churches and pastors to make sure their staffpersons are able to attend one of these summits if it is in their area of specialization. Darlene Burkett’s father, Max Conner, passed away Saturday night, February 20. Darlene is the administrative assistant in Global Ministries. Darlene and her husband, Phil, now Minister of Music and Worship at College Park Church (Huntington, Ind. ), were one of the founding couples of the missionary work in Macau. Visitation: 2-4 pm and 6-8 pm Tuesday, February 23; and one hour before the funeral on Wednesday. Funeral: 11 am Wednesday, February 24. Visitation and funeral location: Smith & Son Funeral Home, 207 North Main Street, Columbia City, Ind. Max is survived by his wife, Sue; Darlene (their only child); and two grandchildren. He and Sue have been members of College Park UB church in Huntington, Ind.